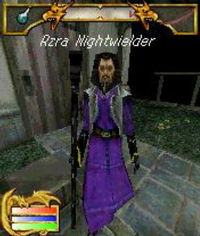 Azra Nightwielder is a shadowmage and the inveterate enemy of those who would seek to misuse the power of such magic. At the start of the events depicted in Shadowkey, he is locked inside a giant crystal in Fearfrost II. It is unclear whether this is meant to be a prison or a tomb; the Scroll of Shadow would suggest the latter, but his subsequent reappearance casts doubt on that. Mage's Identity: Uncover the identity of a mysterious mage. Find Azra Nightwielder: Locate Azra, deep below the Fearfrost Caverns. This page was last modified on 20 November 2008, at 20:39.